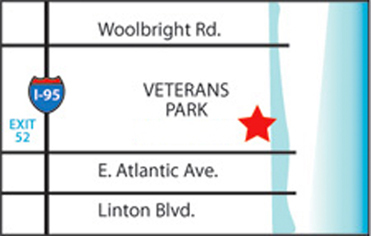 All cruises depart from 801 East Atlantic Avenue (Veteran’s Park), Delray Beach, FL, 33483. Operated by licensed Captains and inspected by U.S. Coast Guard. Trips may be cancelled without advance notice. Call 561-243-0686 for more information. Delray Yacht Cruises is located in Veterans Park at 801 East Atlantic Ave. in Delray Beach, Florida, 33483. From Interstate 95, take Exit 52 and travel east, toward the Intracoastal Waterway. Delray Yacht Cruises is located in the North West Corner of the Intracoastal Bridge on Atlantic Avenue in Veteran’s Park. Parking is available in parking lots throughout the city of Delray Beach. Please click here for parking facilities in the downtown area. Be sure to allow time to park and arrive at our ticket kiosk on time for your cruise! If you’ve parked at one of the East Delray Beach Parking Lots and would like transportation to the cruise, please reach out to Katcha-Ride. You can call or text 561-404-3393 for a ride to or from the cruise if you’re in the East Delray Beach area. This is a free transportation service – drivers work off of tips.